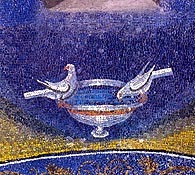 Doves drinking mosaic, Mausoleum of Galla Placidia Ravenna, 1st half of 5th century. The Roman style of paintings, spread throughout the Roman Empire and into the Middle East, North Africa and the rest of Europe. After the Roman Empire collapsed, Europe's greatest inheritance was the Roman-Christian tradition. The Good Shepherd mosaic, Mausoleum of Galla Placidia, Ravenna, Italy, 1st half of 5th century. This page was last modified on 9 October 2017, at 04:36.